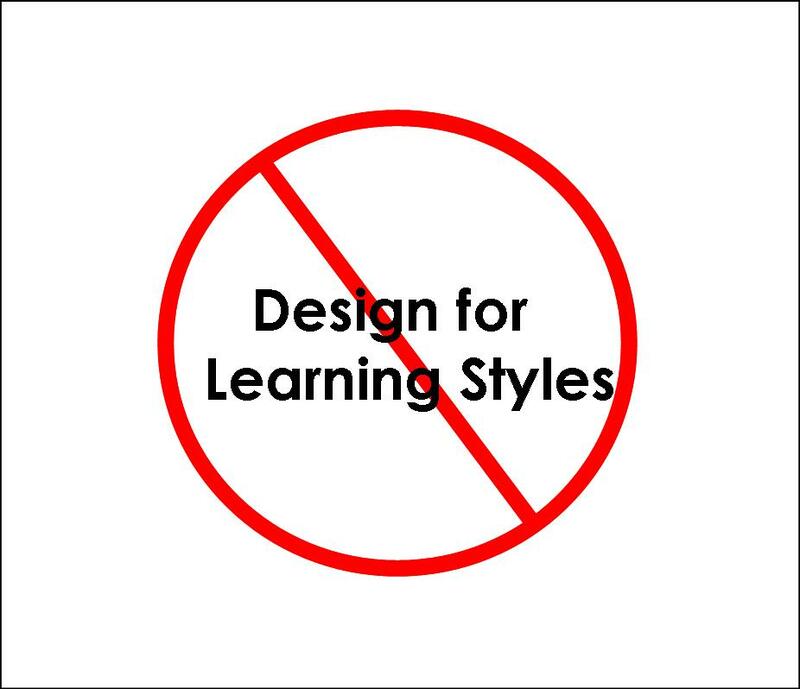 While Learning Styles Preferences may indeed exist – THERE IS ABSOLUTELY NO RESEARCH PROOF THAT DESIGNING FOR LEARNING STYLES PREFERENCES HAS ANY POSITIVE IMPACT ON LEARNING. In fact I’ve heard it from researchers that it might even be beneficial and improve LEARNING if a motivated learner/Performer has to learn outside their preference. Many things in the world are indeed counter-intuitive. Just ask someone learning to downhill ski…you know…lean “out over the mountain” on that downhill ski. Which is indeed counter-intuitive. Try it at home before “hitting” the slopes! Instructional designers are often urged to adapt instruction to students’ learning styles. The persistence of the learning style concept is amazing—a testament to the gullibility of even well-informed individuals who ought to know better. It seems that advocates of learning styles have never heard of the history of ATI research, which attempted to provide a database for adapting instruction to student characteristics and found many thorny problems. It is probably fair to say that the popularity of adapting instruction to learning styles is matched only by the utter absence of support for this idea. Claims for adapting instruction to learning styles, of course, assume that there are stable, replicable interactions between measures of learning styles and instructional methods. A number of reviews of ATI research (Tobias, 1989; Corno & Snow, 1986; Gustaffson & Undheim, 1996) have reached fairly similar conclusions about the types of interactions that have been verified by research. These reviews suggest that students with limited prior knowledge of a domain, or lower ability, require substantial instructional support in such forms as better organization of the content, increased feedback, provision of prompts, and similar instructional augmentations in order to learn optimally. Students with higher levels of prior knowledge, or higher ability, are optimally instructed with lower levels of instructional support. Unless I, and the other reviewers of research in this area, have missed the publication of tons of replicated findings, there is no evidence of stable interactions between learning styles and instructional methods. Why then do otherwise knowledgeable educators and educational researchers persist in making unverified claims for learning styles? I can only conclude that they adhere to what Jeanne Chall (2000) in her last book called a romantic, as opposed to rational, view of education. Chall cites other romantic notions that have little verified empirical support, such as the whole-language approach to reading instruction, open education, and discovery learning, to name only a few. Sometimes an idea may appear so logical, and/or so deeply related to the values held by individuals, that it becomes an article of faith. Believers cling to their fancies irrespective of research findings. 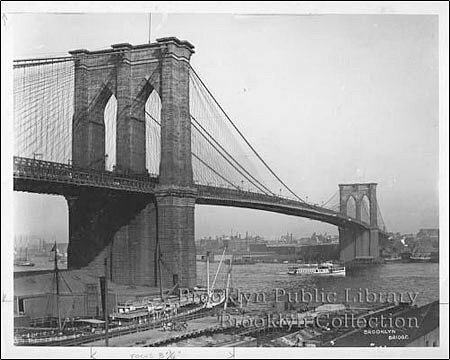 I wish they would develop a similar fixation about the Brooklyn Bridge, because I would love to sell it to them again and again. Some adaptations to learning styles may lead instructional developers to teach concepts using multiple illustrations. In such practices, the instructional material may illustrate concepts, presumably the complex ones, in different ways, leading learners to form multiple representations. The designer may assume that the multiple illustrations work because learners choose the representation that is most congruent to their learning styles. It is probably more accurate that such instruction is effective because the multiple illustrations induce learners to devote more time to these concepts. Of course, more studying time leads to increased learning, as all the research on allotted and engaged time has amply shown. Clearly, however, there is no basis for attributing such enhanced learning, if it occurs at all, to learning styles. The issue of adapting instruction generally, as well as adapting media, to student characteristics is dealt with in several chapters of a recent handbook (Tobias & Fletcher, 2000) sponsored by the American Psychological Association’s Division of Educational Psychology (Division 15). Corno, L., & Snow, R.E. 1986. Adapting teaching to individual differences among learners. In M. C. Wittrock (Ed. ), Handbook of Research on Teaching (3rd ed., pp. 605-629). New York: Macmillan. D. C. Berliner & R.C. Calfee (Eds. ), Handbook of Educational Psychology (pp. 186-242). New York: Simon & Schuster Macmillan. characteristics. Educational Psychologist, 24, 213-227. Psychology, 35, 389-390. Tobias, S., & Fletcher, J.D. (Eds.) 2000 Training and Retraining: A Handbook for Business, Industry, Government, and the Military. New York: Macmillan Gale Group. Additional Blog Postings in Pursuing Performance also address this topic, and the topic of designing differently for generational differences. Also not valid. Use the search function for each of your favorite Bloggers to see what they are saying about Learning Styles. That insight ought to be a bridge for you to better information – or away from false teachings.